ATTN: This site does not support NEO Nazism. Welcome to Project Wolfenstein. 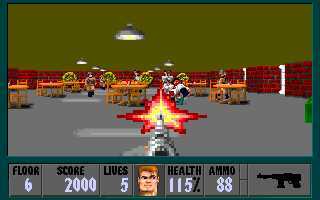 Wolfenstein 3-D and Spear of Destiny (the sequel) where the begginning of PC shooter games. Without them there may not be a Doom, Duke Nukem, or Quake so download wolf or spear, NOW! I hope to make this one of the greatest wolf-sites around. E-mail me your wolf-links and add-ons. The add-ons I post will only be add-ons that have lot's of changes, maps, EXP. graphics. It's been a while, I don't feel like updating lately, just working on my new add-on and my new computer/s. I just got the news of a new Return to Castle Wolfenstein with the Quake III engine check it out at http://www.dailyradar.com/news/game_news_1557.html. The club has been deleted but nayt has made a new one, I've updated it in the links. I've added Western Wall I to my downloads, very very good, even better than BW2SE, my favorite part is the stutus bar. Hmm, I finally updated, I found out about that wolf files site but I forgot the address. Also I made some minor changes. Return to Wolfenstein is finished. You can find it in the downloads. Also I've went through and updated my links section. There is suppose to be a huge FTP site run by DJ and some others that will have plenty of downloads. I will post the address ASAP. I've add-ed them neat arrows and fixed a page fault. The Return to wolfenstein site is up and running, click on RTW Add-ons to your left. My add-on won't be out till Y2K. I want to get as much Source Code changes in it as possible. I've changed the site around, hope you like it! Only 2 levels to go in my new add-on, It will be out in around a month. I've named my addon "Return to Wolfenstein" It will be out after Floedit. Many Many changes. I add-ed a new link, logo fix. I've decided to make an add-on, with source code editing, at least 10 new levels, full version. I've opened my site, check out the page, sign my guestbook. I've made a new site since my old one was destroyed, Please feel free to browse and don't forget to vote on my poll and sign my guestbook! (NOTE) All untrue and disgusting messages will be deleted immediately.